i am truly struggling with how to handle a situation that has been presenting itself, in various forms, for over two years. I've written and re-written this post countless times, because honestly, i don't know how to address it. this is about the weekly challenge in its current form, the way i do it, write it, and how to go forward in the future. Obviously, the internet is big enough for everyone. When i began this challenge, i had no idea that the challenge would take me in this direction, that it would become what it's become, that i would call so many of you dear friends. I try very hard to put out a new challenge for you all to do each and every week. Some weeks are more challenging than others because my life is so crazy with the boys and Artoo's health problems. But i don't want to get into that because even when i tell you about his health, i really tell you very little. I don't want this blog to be about that, it's sort of my oasis where i come to 'get away' from my life. if that makes sense. Over the past two years, i have put in countless hours to bring this blog to you. Any of you who blog regularly know what a time commitment it can be. When the first other weekly challenge site popped up, i was flattered in a way. Erin's Zendala Dare has been successful and she's a real peach - super love her. So, i thought - okay, Zendala's are gonna be her thing, and i've not done a zendala challenge since (or at least, i don't think i have). It was a conscious decision i made based on the idea that the internet is, in fact, big enough for everyone. Since that time, my little 'challenge pool' from which i draw from has been getting smaller and smaller. The newest challenge offerings have been Duotangle and (the latest) Monotangle challenges. I really don't know how i feel about these, because i know for a fact that those terms were both coined in my basement while writing my own weekly challenges. I have to say that it's really awesome that those Zentangle terms have gone out into the world and become part of the Zentangle vernacular, but i'd be lying if i said that it doesn't leave a weird feeling in the pit of my stomach. in fact, it's giving me great anxiety. As i write this, my palms are sweaty, there are about a billion butterflies doing Zumba in my belly, and i feel like the world's biggest jerk. Am i upset that they there are other challenges out there? No! More power to you!! Challenge away. A few months back i had an email from a lady who was interested in writing her own weekly challenge and she was looking for help and ideas. I told her i couldn't and wouldn't discourage her from that, but that she she should ask herself if she could offer something new that's not already offered. There's a feeling of sadness, though, almost like betrayal but maybe not as strong as that. A feeling like maybe you don't think i'm doing a good enough job maybe? what can i do? Is it necessary to Trademark the terms Monotangle and Duotangle? Does it need to come to that? i don't want that. But my first reaction to hearing about these challenges (thanks to those of you who emailed me to tell me about them) was "Now i can't do Monotoangles or Duotangle challenges on my own blog?" and it made me sad. Frankly, i love doing both of those things, they are my favourite, and it kind of feels like something has been taken away from me, albeit unintentionally. I just want to be able to continue doing my challenges.... and it's kind of hard to come up with a new challenge each week, let alone limiting myself because of other blogs. I kind of feel like it applies. I suppose i should just be proud that my challenges have been successful. i'm going to continue to issue monotangle challenges, and duotangle challenges when the mood strikes, and whatever comes into my head on Saturday night while i write. I am going to stay off those blogs and just know that should there be a repeat it's purely coincidental - and hope that you all still love me, and pray that i'm doing the right thing. Does it seem like something has been taken from you, such as being robbed? Which, due to personal experience, I know how awful a feeling that is. Being a giving person who likes keeping things okay for everyone usually means you also are a sensitive person. A wonderful quality. With all that is going on in your life, a good vent helps to keep your head above water. Vent away! I haven't participated in one of your challenges yet but enjoy them all. I've just started zentangling. Thank you. First, (((Hugs!!)) You have to know we LOVE your challenges (and go zonkers on weeks you don't post a challenge--ack!!) As great as it is that others are takingup the initiative to post other zentangle challenges out there, as quickly as zentangle is growing, this is the place where we all come first on Monday morning, looking not just for our weekly Diva challenge, but for bit of news and pics of the boys and the snow and your world which makes Mondays more than just a little bit brighter...Please don't feel crunched or limited and please please please don't stop posting our Diva challenges!!! Love & Hugs!!! I remember when I was in the CZT conference in RI, Maria told me " do what you love to do!" as an affirmation that what I was doing wasn't right or wrong but something I love to do. So, just do it. Laura, just do what you love. hopes this help! I can understand how this would weigh on you. It shouldn't. I am really busy and don't always get to the challenge in time to post. BUT, I ALWAYS find a moment each week to check in on you. I enjoy your blog for many reasons, only one of which is the challenge, and I imagine most others who check in regularly would say the same. I can't believe you've managed to keep this moving for so long - a regular blog is a lot of work. Stay true to what feels right for you - Zentangle is supposed to help with stress - not make it worse :-) Your friends will all be here, even if we only quietly admire from our chairs. But yes, I do understand the feeling of loss when you see someone staking a claim on "your territory". Feel free to vent - you have friends here! Then sit down with a glass of wine tonight. I don't always participate, but I love your challenges and I love reading about your family. Going along with what Kathy said, the challenges aren't the only thing that keep me coming back. I'm sorry you are having stress about this. I hope nobody would have a problem with your issues with this, I'm sure it's disturbing. We come back because we like the "feeling" here and that will always, only, EVER come from you. Perhaps you can take comfort in the fact that you are not the first person to have been copied on the Internet. It has been happening for decades. Nor are you the inventor or an Internet challenge, those have been around a long time as well. Blogging, the same. Words like "monotangle" are as old as Zentangle, though perhaps have found a wider audience here. Trademarking is difficult enough for multinational corporations here on the Internet, so unless you have a huge legal hugest and clear proof that no one ever used a word you think you in e red before you, good luck with that. I took a class on blogging a couple of years ago. One of the main points was not to worry that a cajillion other people are doing the exact same thing: YOU are doing your thing in your own unique way. And that makes you special. And you already have a very loyal following. I look forward to Monday mornings because of you, in case my first statement didn't make you feel unique enough. I wake up on Monday and think, oh! gotta go check the challenge! ... and I've only been around since July, and posting since October. And, I write a blog that contains stuff about Zentangle... how many of those are out there? I know that mine is unique because it is my unique voice. Also, it is part of a larger whole, that is growing. There will be more blogs and websites, but only mine is about me and my interpretations. Anyway, I hope I am helping with keeping you here. Even if I do a zendala here, or a monotangle there, there is only one DIVA!! Diva, I am fairly new to participating in the challenges, and have not been interested in trying other ones. I feel life is full enough that I can only keep up with one challenge a week. I don't think you have to change the way you do things just because others are copying, heck, your blog has a long history and it can be viewed in entirety so if anyone questions who came up with what it has a "paper" trail. Personally I don't want you to stop anything you normally do, because I am not intending on even checking out other challenges or dares so I would feel like I was then missing out on some components because of that. Also, I cannot imagine your job keeping up with putting out the challenges weekly. I know it might be hard but hope you really don't let them bother you too much. Maybe you can incorporate a term like "the original weekly tangle challenge" or something as a description for your blog or a slogan. Personally, I am put off by trademarking terms, but appreciate knowing where they originated. Just remember WHY you do what you do and let that be your guide. You've expressed your feeling very well, IMO. Keep on tangling. Your uniqueness shines though. I agree with Mary. Only you can do what you do the way you do. And Dr. Seuss would agree: "Today you are You, that is truer than true. There is no one alive who is Youer than You." So please keep posting your challenge. You are doing a service that reaches into our hearts and brings out creative responses that we would not have realized without your challenging us. I think you should offer any challenge that occurs to you, and not worry whether someone else is doing a similar challenge that week. There are too many people playing in the pool to worry about accidentally stepping on someone's toes--it's going to happen no matter what. However, you vary your challenges enough and enough people only do your challenges, that you would be treading very lightly when the event occurred. And you were in the pool first, so you kinda get to set the rules! "I just want to be able to continue doing my challenges" You answered your own question. There's only one "you" so no matter how many try to imitate you....they can'y...and vise versa, just keep doing your thing Laura, and let the others do their thing. And (as the saying goes) let the chips fall where they may!! Ya gotta realize your success is not just the zentangling, it's the YOU that we all get to know and love. I don't participate but I read your blog regularly. I love your challenges. They inspire me when I need my quiet time and I'm doodling in my art journal. Don't worry about others. You are unique and you have your readers. You are special. As Emily wrote: "Just remember WHY you do what you do and let that be your guide." And your readers will follow! And I think it's O.K. to feel the way you feel, thanks for sharing your thoughts (and part of you) with us. I am new and probably shouldn't get in the fray, but I wanted to say this. I understand the feelings you are having, but I hope you know what a stand-out your blog is. I say don't even worry about what others are posting. Yours is the standard by which the others hope to be measured. Chin up. I've been away because of nursing school, but now that I've dropped out of school (it wasn't worth losing my sanity) I'll be checking in again. You are a magical person with such a unique outlook on life. You inspire people and we all get a lot of joy out of your challenges. I think you should do just as you said. Keep doing challenges and don't worry about what anyone else is doing! You are an original! Laura, please know that what I have found challenging about your challenges is the way you switch up and take us out of our comfort zone. I am so glad you will continue to do that....even zendala challenges....please do not limit yourself! I really love my early morning zentangled joy! Thank you so much! Please, please continue with your challenges and your sharing of your life! Others may try to emulate, or compete - but YOU ARE THE DIVA!!! Oh so many of us look forward to Monday morning (obsessively) so we can check your blog and find out how you and your family are doing, and then you inspire us further with a masterful challenge. You are the connection for a very supportive, inspiring Zentangle community (and more). Your numbers don't go down - they go up each week, and the reason is YOU. I love the quote from Dr. Seuss from Dianne - it's perfect for this situation. I admire you so much for putting it out there and telling us how you feel. We LOVE you! Sending a big hug with "please don't worry about it all, everything will turn out right just like a Zentangle"
I haven't seen the other sites or known there was a problem so I will happily blog along with you Laura and be grateful for what you share! Times like this I wish I could pop over with a bottle of wine! Laura, your amazing. Your family is amazing. Your blog is amazing. And your challenges are amazing. Don't let anyone sway you from putting out what you want to each week. There's only one you and that's why we come back week after week. Laura, sorry you are struggling so much with this. I do not know what will happen with the other challenges, but I do not think there creation means that you need to change anything that you are doing. There is not a lot of new things that I can add that has not all ready been said in the other comments. You, and what you present, is unique. 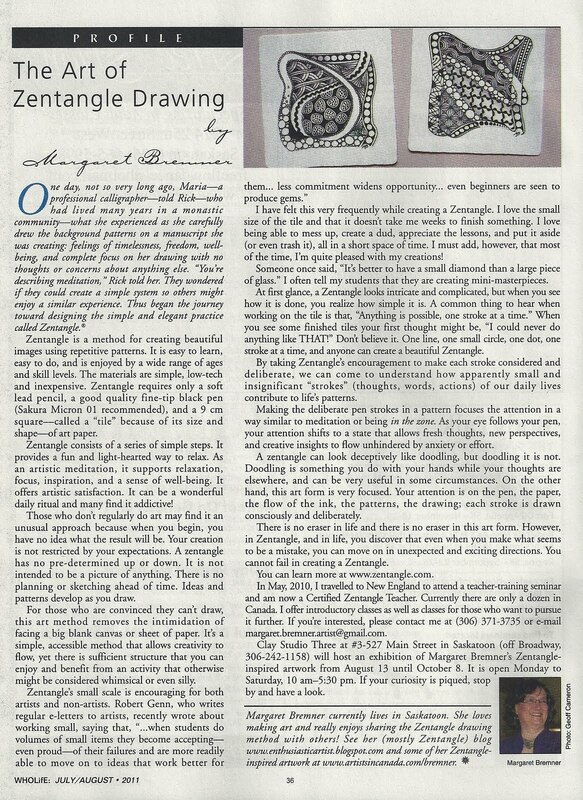 I like Shelly Beauch's comment that like a Zentangle everything will turn out all right. That is exemplified in the diversity of submissions in your weekly challenges. They are similar but so different. I would not worry about duplication and I do not think that the many people who participate and look forward to your weekly challenges would even think twice about it. Continue doing what you are doing. I had heard the terms monotangle and duotangle from my sister and did not realize that they originated with you. I hope no one, particularly you, misunderstood my comment about hearing the terms from my sister. I was not implying that she came up with the terms. Only that she had a few years experience with Zentangle® and when she used it I thought it was just part of the language. I do not remember her saying where it originated. Laura, let me start by saying I support you and understand your feelings. With that being said, the whole Zentangle thing seems to be about sharing art. Do people copyright the patterns? I use so many patterns and never once have sited the "author" of the pattern. Aura, Hollibough; Are those terms copyrighted? My thought on this is that you be proud of being imitated. You do this for stress relief, so don't let it bring you stress - it's against the law of Zentangle! Rick and Maria have shared so much for "free". I've been doing this for only two months, so my knowledge is limited. I do know that your site is bookmarked as one of my favorites. I love your ideas and seeing your art and everybody else's is an inspiration to me: one who always thought she had NO art skills. Thanks for what you do and just try not to stress about it! Maybe you should release a challenge every other week or maybe you should do an ABC challenge - use only patterns that start with A . . . or maybe a challenge for us to make up challenges? Just some ideas! Ps - look at your map - you are Diva Worldwide!!! I am not going to repeat what everyone has already said - but from what I can gather it looks like the feeling is unanimous: DON'T STOP DOING WHAT YOU'RE DOING...!! And be free. You have enough other stresses in your life, my goodness! Good on you for writing this post and getting it off your chest though - big respect. However you do not have ANYTHING to worry about. Love and hugs - oh and massive thanks for what you do. Hi Laura, We all love your blog and your Weekly challenges. Please keep going and I think you are right to not restrict your challenges just because others are doing something similar. I think that you should also look on the other challenges out there as a form of flattery, they have seen how well your challenge goes and how everyone enjoys it and copied. Thanks for all the time and effort you put in to the challenges, we all really appreciate this, especially with your hectic life. Laura, first I want to say that I'm sorry this brings you so much stress and anxiety. It should not be that way in zentangle. I agree with almost evreything that is written above and want to name the comment of Mary Ellen especially. What you feel I can absolutely understand and I think I know a bit what we are talking about. Some years ago I got a mail from a friend with a link to a website where one of my poems was posted with the name of someone else under it. Can you imagine my feeling about that? Later on I decided that maybe I had to see it as a compliment, because she thought it was good enough to put here name under. So, again, I know the feeling (yes, I know this was different because it was really stealing). On the other hand I also do understand that other people like to make their own challenge and I'm quite sure they absolutely don't want to hurt your feelings. I started with your challenge a year ago and always love monday afternoon (it's afternoon in Holland when you post it). I sometimes open your blog many times to find out if the new challenge is there. So, like so many people I LOVE the challenge and to read your stories. Especially you take me out of my comfort zone and that's a great thing. I do participate in Erin's Dare and also like that a lot. I have done my entry to Roy's blog this morning, because I decided that I could do another challenge in the week. I myself see no harm in this and for me it's possible to have more challenges next to eachother. Your decision to keep all the possibilities open is the only right one. So, stay with yourself and do what feels right for you. That we all love you is a fact. I didn't read ALL of the comments, but I read enough to see that you are well-loved and well-supported here, doing your thing just the way you do it. Since you are a busy Mom of two, one with special needs, it is obvious that your time will be spread thin. Always spread thin, right? But I come here to read about your life, and about Chewie and Artoo and your vacations every bit as much as I come to find out what the challenge is for the week. You are the Diva. You have 814 followers. There is room for others, but they will not be YOU. And monotangle? duotangle? The copyright thing with Zentangle turned me off in the beginning. I would suggest you not worry about it, or, if you want, put a (c) after; it likely won't make any difference, anyway. All hugs and smiles to you, Laura. I am new to Zentangle and I just love it. I was thrilled to come upon your the Diva Weekly Challenge and have been following each week even though I don't submit my renderings. Keep doing what you are doing and know that we all support you. If you are concerned with others using terms you have originated, I would suggest copywriting those names. I don't see it being offensive if you take ownership of what is originally yours. Others may use it, but they would (should) get your approval to do so. I am in another group that had similar experience (someone wanted to use our name for their website) and we told them they could not, we also trademarked our unique name. As you mentioned, the internet is huge and there is room for everyone, but people who originate things do protect their interest. Nothing wrong with that. Keep doing your thing. I for one, love and appreciate your encouragement to Tangle. Take care of you!!! Everyone goes through these moments of doubt. Maybe your having less readership because others have "things" in their lives that are taking away their attention from your blog and zentangle. Everything has a flow, up and down. Your blog is wonderful and we all appreciate how much work you put into it. My advise, like so many others, is just keep doing what you do. The doubt will go away and your following will grow again. If Shelly arrives at your door with a bottle of wine please give me a call I would love to meet you both! At first I was just amazed at this post. I just couldn't believe that the other challenges out there would bother you in the least. I mean YOU are Diva. THEY are the copycats. In my book...who cares? I find copying to be a great form of flattery. I had not noticed that your participants list was smaller. (I've just joined about a month ago). There are going to be challenges, luv. We all adore you for taking the time to set this up and keep us informed and creative. Whether or not we do other challenges is inconsequential. You HAVE to get to the "Whatever" on this. Really. The internet is a PUBLIC place and people will do whatever. Just because someone has a monotangle challenge too...it means nothing! Just more fun. If people feel like being in two or ten challenges.. fine. The fact that you invented the title seems to be to be a huge compliment! Please know that we all love this challenge THE BEST. It is the most organized and well thought out. We all give you credit for starting all kinds of creative movements in Zentangle. Carry on. Wish the other challenges well. Believe me, when they find out the work involved...many will drop off after awhile. I agree with al of the above . cant say anything that has already being sad but now that we love you and there IS only one diva and that is and always will be YOU! I am sorry you have this anxiety in your life. You are NOT a jerk. I cannot imagine having the Imagination and skills you have and so generously share with us. Just wanted you to know that while I haven't posted anything, I enjoy your blog and appreciate the time and talents you share with us. "Ditto" to all that's been said - most especially, you're not a jerk! Please, breathe, continue as you are, let the rest of the world take care of itself. Your challenges rock - thank you for sharing as you do! There is a lot I want to say, but the words won't come. You are doing a great job and don't let others get you down, we all need an outlet from the challenges we face in life, so keep your chin up and continue doing what you do best. I don't always get the callenges done but I normally enjoy checking out others art work. Oh, and I enjoy reading your blogs, I will try to comment more often. I agree with all the truths and encouraging words here. Your blog was one of the first I found when I was checking out this Zentangle (c) thing. Let me just share a moment, what you, and your blog, have done for me. 1. You've inspired me by sharing the joys and challenges of your day-to-day life. 2. You've taught me a lot, just from combing past posts, and enjoying the incredible resources you've shared. 3. When I was brand-spanking new, about 6 months ago, I looked over your past challenges, and recognized yours as a "safe place" to dip my toe in.. a place of sharing and appreciation for tanglers of all levels and talents... It was non-competitive and gave me an insight to the heartsong that is Zentangle. 4. Through visiting the stops along Mr. Linky's trail, I've come to know and love so many in this community you've created, and it's allowed others to come to know me too. You gave me a sense of belonging, and of being welcome. 5. You've done the impossible (grins). I look forward to Monday mornings now, and often hit your site a few times, well before the email notice of the challenge come through. Laura, you, and your life, are so unique and special, and nobody will ever change my affection for you, and gratitude to you, for creating this wonderful place. I'm so glad you let us know how you are feeling, because it gives us the opportunity to, in some small way, show our gratitude with heartfelt words of support. For a long time, I tried every single challenge you posted, and only the past few weeks, haven't been able to manage it, for reasons that don't matter, except to say that it's not because I'm doing challenges from other sites, instead. No site, and nobody will ever inspire me as you have.. as a person, not only as an artist. In my minds eye, you're at the front of the line, and the only way you can stress yourself is by looking backwards to see the others. This is no insult to others, just the truth. You don't live your life by looking backwards. Do yourself, and all of us a favour, and keep leading us along this happy, inspiring, life-enriching trail. You are Laura Harms, CZT... You are our beloved Diva. In times of doubt, just read this list again and again, and please, reach out if you feel the need for support. We're all right here. Let me add one more voice to the chorus that is here to support you: Keep doing what you are doing and ignore any outside noise. You are free to challenge your followers with any and all iterations of Zentangle, past, present and future. Your kindheartnedness shines through your blog. A very wise woman once told me, God made you sensitive so you would be creative, not to beat yourself up. Keep sallying forth! Bless your heart! You are WAY to hard on yourself. When people solicite advise from you, first, it's a compliment and second, give an honest opinion. IF they don't like your advise, that's their problem. Next, I would advise you to give yourself a break. It's o.k. to go on a "blog vacation". You've certainly developed a large catalog, so you can leave a "greatest hits" post. Take care of yourself first. We in the blogosphere will be alright (although we will miss you!). Hi Laura. I know when I first started my blog I was inspired by your challenges (still am). I wanted to start doing challenges on my own blog, but I felt unless I could come up with something very different from yours: 1. I felt like I would be stealing 2. your challenges are always amazing and definitely challenging:) Remember YOU ARE THE ORIGINAL DIVA that began the challenges and your name soared throughout the CZT world. Rick and Maria (and many other CZT's I know) always refer to your web site for great ideas/challenges. People admire you for what you have done and continue to do. Maybe a new challenge is presenting itself to you to help you soar even further in the land of CZT's. Ask yourself how can you step it up a notch? Now that I have competitors what is going to make me stand out from them? What other creative ideas have I been sitting on that maybe I should start sharing with the world. The one thing that sets you apart is Artoo and your blogging about your life. It allows us to see just what amazing people you and your family are ;) I always follow your challenges, I just haven't had time to do any of them and post them, but I am always inspired and try them when I get a free moment. I totally get your feelings!! I'm so new to Tangling my pens are still fresh and I'd never share one thing online!! lol!!! I found your site a month or so ago and was hooked!! It's not just the challenges that bring me back, it's you! I share your name for one thing, but I also feel I can relate to you. One thing I always have to keep in mind when thinking of ideas (my husband and I are business owners) is that there is always room for one more. Think of burger places...we've got so many to choose from, yet we all have a favorite. Here in California who hasn't heard of In and Out? Yet I heard ads for them on the radio all the time. It makes me realize while there are others that do what we do, it's that thing we have that no one else has that makes us desirable...and usually that's the person behind it all. I've only been zentangling since June. When I happened upon your blog, I was immediately hooked. Honestly, I don't know how you do it all -- kids, hubby, job & family plus your blog! I admire you. With all the challenges you face every day, I can't believe you have managed to continue doing your blog plus coming up with new ideas each week. What is so refreshing is that you have the courage to express your fears and upsets on the web for all to see. That is what makes you so special. I hope by now you've gotten it -- WE LOVE YOU! We don't want you to stress or be upset! Do what feels right for you and we all will support whatever that is. BECAUSE OF A DISABILITY I AM HOME MOST OF THE TIME. YOUR WEEKLY CHALLENGE BRINGS ME SO MUCH PLEASURE - I LOOK FORWARD TO RECEIVING IT. THE ARTISTIC WORLD COMES TO ME! IF I WERE YOU, I'D DO ZENDALAS, MONOTANGLES, DUOTANGLES, AND ANYTHING ELSE YOUR HEART AND CREATIVE SPIRIT DESIRE. GO FORWARD IN PEACE AND CONFIDENCE. WHY SHOULD YOU ALTER YOUR COURSE? YOUR EFFORTS ARE SO APPRECIATED! I THANK YOU FOR THE BEAUTIFUL CHALLENGES YOU HAVE DONE, ARE DOING, AND WILL DO. PLEASE DON'T BE DISHEARTENED. I'm sorry to read that all those other challenges upset you so much. But I admire that you share your feelings with us, and I can understand your concerns. But Always keep in mind that YOU are OUR DIVA. At monday's I always check your blog several times to see if you already post the new challenge. Not just for the challenge but also to read about your life and your cute boys. I hope you will understand that we all LOVE your very much and it is YOU why so many people are visiting and folowing your blog. So please please keep on going blogging and posting challenges, you and your challenges make me feel like an artist. Hugs from the Netherlands and keep it up Baby!! Laura, I think others see your success and just want a tiny piece of success for themselves also. Imitation truly is the sincerest form of flattery. I think your decision to just keep going and "ignore" the other blogs is perfect. As long as you know you are doing original work, then don't worry if someone else also came up with the same or similar idea. Thanks for what you do. I am also one of those who looks forward to your Monday challenge. Keep up the good work. Dear Laura, because of YOUR challenges, YOUR story's, and because, no matter what happens in your life, YOU stay (oh my, I wanted Interglot to translate "opgeruimd" into English and I got:) cheerful, enthusiastic, happy, gay, bright, buoyant, sunny, enchanted, vibrant, merry, attentive, amusing, eager, joyful, mystified, joyous, pleasant, jolly, spell bound, reliable, dependable, festive, trustworthy, under enchantment, passionate, neat, funny, animated, safe, trusted, clear, colorful, eagre, orderly, arranged (how did they know all these?! ), I will always be YOUR fan!! Viva la Diva! I don't always do the challenges but check your blog every Monday and always see the slide shows as soon as they are posted. It is not the challenges but you who brings me to your blog. I like knowing how your week went, how your children are doing. Just keep doing as long as you can do it. Forget about others. See you next Monday and every Monday. I am and will continue to be a participant in both yours and the Adventures of Monotangles...as long as this stays drama free. I crochet more than I zentangle and Im in a closed group of crocheters who have shops on etsy/facebook/or personal website....and every artist deals with this issue in their own way....but we have that group so we can keep the drama off own page and vent to personal friends and family. Please do not alienate your fans and have them be forced to choose between you....or another fellow zentangler. It makes for ugly comments towards others. I love your challenge. I will love others challengers. I may do other challenges. Stop stressing out. You were the first and as long as you keep on going like you have been then you will be the last! If I were you I would look at it like this, The others are copying you, you should be proud of what you have started. If you need to trade mark your ideas and names then so be it. Just be proud and happy for what you have brought to all of us out here in cyber land! Laura, You are the Diva, You have your very own tangle pattern named after you, made for you by Rick and Maria. Your weekly challenge is amazing. I don't always have time to submit my results or get them done in time, but I ALWAYS check in on you every week. I love your challenges and I don't want you to stop. I give your website out to all of my students to keep them from getting in a "rut". I don't have time to check into multiple websites, so yours is my go to site for challenges! Thanks so much for all that you do! Ditto pretty much all of the above. Definitely, keep up the GREAT work! And keep the challenges varied, that's part of the charm of the Diva's challenges. Perhaps, when posting a monotangle or duotangle challenge you could say something like 'a term coined by me on (date) in (this post)'. I expect they've become such normal terms on Planet Zentangle that no one thinks about how they came about. I do love your challenges and news about the boys. Don't change a thing. Laura, "I am the Diva" is why I had to have a blog. I wanted to be a part of this wonderful community. This is where I go on Monday morning to see what the next challenge will be. I follow your blog during the week to see what wonderous creations all my Zentangle peers have made. I don't thing anyone is intentionally raining on your parade, I think it is excitement and fun of Zentangle. Your blog is alive and well, and we all look forward to being a part of it. people starting learing from the other by birth, decenia learning by teachers in life first truh the mouth than by caves drawings, stone, holy bibles beautifull made by monks and now by internet. The world is beautifull filled with people drwaing on his or her own way. The diva is the diva a learning and sharing by blog. I realy understand that sometimes your mind will be emty for a while. Take sometimes a braek when you need it! Or aks a friend to help. Whenever you have the power to go on and most importend off all you enjoy it......follow your hart. 60 comments! And this is the 61st! Now doesnt that tell you something!!! I didnt read all the other comments, just a few. But I am sure we ALL have the SAME thing to tell you - Please DONT STOP. Just continue doing what you do best - give us a new challenge every week!! That said, more and more people are discovering Zentangle each day and there are so many of us who actually LEARN through challenges like yours...!!! participate. I do try them all out at my desk. You're the DIVA. Firstly - I hope by the scale of response shows you how much you and your blog means to everyone - tanglers new and experienced. The love and respect is completely justified you do a brilliant job. There is only one Diva :-)) Keep offering advice to others who might want to do the same sort of thing - it will only make you stronger. I hope this puts your mind at rest a little. You have enough on your plate without adding to it. I second what Margaret Bremner said. . . Lots of us newer tanglers have heard the words mono and duo tangle, but didn't know where they came from. Doesn't surprise me that it was YOU! and wouldn't hurt for you to take credit for them. Love your blog, your family info and especially the wonderful challenges as well as seeing your work. Thanks and keep it up if you can. love and hugs. . .
Imitation is the sincerest form of flattery. According to Wikipedia. It is an advanced behavior whereby an individual observes and replicates another's. It's also a form of social learning that leads to the "development of traditions and ultimately our culture. It allows for the transfer of information (behaviors, customs, etc.) between individuals and down generations without the need for genetic inheritance. I wouldn't worry about people coping. tangling, zentangle, doodling... As for the shape of the art form? It's endless. People like to work on a particular shape or monotangling because that's where they feel they are better at. And we all want to shine our very best. You my dear have already made history and the rest of us are followers. PS I always check here first thing Monday morning to see if I can do a challenge. Sorry to be so late in commenting on your post Laura, but have been away having a lovely time in London for the weekend as it is mother's day here in the UK. It saddened me to read your post about your worries and concerns, especially as you have been having a very emotional time lately with the loss of your Grandmother. I can only add, I look forward to Mondays so much and have learnt so much from your blog, long may it continue! Sending a hug over the Atlantic!! Laura, I just found you recently and when I first started reading you post I thought you were going to stop your wonderful challenge blog. I fully appreciate you and all the time you put into this. I'm my 88 yr.old Mom's primary care giver and I don't find all time you do with your son's health and young family to do my art. As artists we all feel angst from time to time, please don't let the copiers get you down. Know you were first and take pleasure in that. There will always be copiers even if you trademark. Some people will always be rule breakers no matter what you do. I love your spirit, art, and above all the time you devote to giving all who come to your blog a place to play. Thank you, 2 small words that I hope will make a difference. I think a lot about your words... and my feel is that you deliver every week much more than a zentangle challenge. You give us part of your life, your essence and this is real and you are an adorable person. Every I wait for your post, your histories about you and your beautiful family. I love Artoo and Chewie, and I feel you as a friend. Hugs! Laura, your challenge is the first and it's the thing that allows so many of us to view each other's work. I look forward to creating and then participating in the "gallery" of all the wonderful "jewels" that are presented for each challenge. You always ask us to "stretch" our creative muscles and share with each other. It is such a gift and I appreciate all your time and sharing. The wonderful part about this challenge and the Zentangle community is the participants. I never see any negative comments; all I experience are positive thoughts and sharing. That is the gift of this creative process; we're all in this together. Sharing our creations, tangles, and thoughts, it’s wonderful. I hope you don't focus on the negatives and realize what a wonderful gift you give us each week. The fact that your terms are now part of the vernacular of the Zentangle community is wonderful. I get excited every time I see someone incorporated one of my tangles in their work. I hope you can enjoy your work, I know we all do each week. Thank you, you were the first... and who else gets an official tangle designed and named for them? Please enjoy and feel the love and support. Just do what you do. We enjoy what you do, I never post the challenge because I enjoy just the process and your prompting. A bazillion people paint portraits (so do I) and there is room for all. You are unique and only you can come up with your art no matter what you call it. It doesn't matter how many followers you have. Those who have "left" will be the ones who will be missing out - and I can't be here all the time either- doesn't mean I've left Thank you very much for your hard wook. I too am sorry that this had caused added stress in your life. Clearly as a working Mom with two wonderful little guys and that very special husband – your commitment to all of us is amazing! Zentangle has given so many of us a way to create something that is unique and beautiful – and for many of us that is definitely a first in our lives. You have provided a special place for that community of people to meet each week and rise to your challenge. I don’t submit tangles every week, but your blog is my first stop on Monday morning and your challenge guides my tangling for the week. As all have said – others may come and go – but your blog is unique – it was the first and it is the best! Thank you for sharing your talent with all of us. You have made a difference! Diva, Diva, Diva ... pls continue sharing your family stories, & your world of Z-wit, Z-wisdom & Z-challenges. You are unique! I'm not a CZT, I have no blog, but I follow quite a few Z-blogs. I have a list of my top 10 favorite Z-blogs ... your's is the first on the list. Your Monday posts make my week. I've followed your blog for almost 3yrs, and have kept a log of every challenge. I've recently begun a Diva-Challenges-Journal and plan to complete them in chrono order. My guess is, if I'm out here quietly working on and re-visiting your challenges, there are hundreds of Diva-followers in every corner of the Z-world just like me. And I have to say, while I've seen and even written down the challenges of others ... I've yet to complete one ... except for Erin's zendala challenge, I've felt that the duplicated efforts of others is just that ... which is why I started my Diva-Challenge-Journal. I've toyed with the idea of starting a blog (but I'm an e-dino) and have thought of a few challenges that I haven't seen, but might use to help grow my imaginary blog. If in 6 months my imaginary blog hasn't come to life, I will send you my challenge ideas as a thank you for all you do ... but only if you promise to keep challenging the Z-world in your own time and in your unique way! Your blog is filled with reciprocity thanks ... you're thankful for your followers, but you can't begin to imagine how thankful your followers are for all you do! YOU ARE MY EVERY MONDAY MORNING. JUST THIS MORNING ON THE WAY TO WORK I WAS TELLING MY SELF I HAD HOPE THINGS WERE GETTING BETTER FOR YOU. I RAN ACROSS A QUOTE AWHILE BACK FROM AYA ANGELOU..SHE SAYS "I'VE LEARNED THAT PEOPLE WILL FORGET WHAT YOU SAID, PEOPLE WILL FORGET WHAT YOU DID, BUT PEOPLE WILL NEVER FORGET HOW YOU MADE THEM FEEL. YOU MAKE ME FEEL AWSOME. I LOOK FORWARD TO YOUR BLOG AND I DONT START MY DAY WITHOUT IT. YOU ARE THE ONLY ONE I GO TO FOR INSPIRATION..I COULDNT EVEN CARE LESS IF YOU ZENTANGLE OR NO TANGLE ITS IS ABOUT YOU AND ONLY YOU.YOU ARE AWSOME. Diva--The following quote by Canadian Violinist, Lara St. John, speaks volumes. "There is no earthly reason why a solo string instrument or voice, having the possibility to play or sing pure intonation, should want, or try, to be tempered." You're the artist, your blog is your instrument. All you share of your life, your family, your thoughts and insights are the string vibrations that no other person can duplicate. Your's is the instrument we want to hear. Imitators will spark and fade, Diva's evolve and mellow like a priceless straDIVArius! Do what you do best! That is to inspire us! OMG! You do not need to worry about those other blogs. You are an original. You can post anything you want to post, it doesn't matter what they do. You are so generous and giving and have the patience of a saint with all you go through. Just do your "thing" for as long as you enjoy it. I look forward every Monday to your post about your family, your current traumas and your endless goodwill towards all. I hope the number of posts that are here is enough to help you realize that what you do isn't only important to you....but to those of us who love coming here, learning from you, (in more than tangle ways!!) YOU are the inspiration! Don't worry about others who may be trying to copy you, they will come and go.....YOU NEED TO STAY!! love and hugs, thanks for sharing your thoughts about how you're feeling. Keep up the challenges! When you do throw a new challenge out that involves a monotangle or duotangle, maybe toss in "home of the original" as part of your title. Let's all the new challengers know. You will always be one-of-a-kind! Challenge on my dear, challenge on!